The Spirit of the Lord is upon me, because he has anointed me to bring good news to the poor. He has sent me to proclaim release to the captives and recovery of sight to the blind, to let the oppressed go free, to proclaim the year of the Lord’s favor. The kingdom was present in Jesus’ ministry and his disciples’ actions as described in Acts. Those first Christians continued Christ’s mission by proclaiming the Living Christ, inviting all people into fellowship, valuing the worth of each person, generously and compassionately meeting their needs, and pursuing justice and peace for everyone. Our call is to reclaim the same vision and passion for the full mission of Jesus Christ today! It’s time for us to be a prophetic people characterized by uncommon devotion to the compassion and peace of God revealed in Jesus Christ. Christ’s mission is our mission. From this point forward, all ministries, personnel, and resources of the World Church will be focused on the whole mission of Jesus Christ through five, life-changing, church-changing, and world-changing Mission Initiatives. We are poised to share the peace of Jesus Christ with those who are waiting to hear the redeeming words of the gospel. We are poised to be Christ’s hands and feet, reaching out through compassionate ministries that serve the poor and hungry and stop conditions that diminish the worth of persons. We are poised to restore Christ’s covenant of peace, even the Zion of our hopes. The hope of Zion will become reality when we live Christ’s peace and generously share his peace with others. We are poised to equip men, women, and children to be true and living expressions of the life, ministry, and continuing presence of Christ in the world. We are poised to become congregations that are the true and living expressions of Jesus Christ, woven together by the Spirit, and sent into the world as evangelistic witnesses, compassionate ministers, and justice and peacemakers. In response to God’s Spirit we are moving from being a church defined to a great extent by organizational needs to being a church driven by Spirit-led mission. You are invited to put your heart and soul into mission: the divine mission of evangelism, compassionate ministries, and justice and peacemaking for which Jesus Christ lived and gave his life! Our World Mission Tithes will go to fulfill these five Mission Initiatives. You can support any or all of the Mission Initiatives in a variety of ways. Weekly offering envelopes used in congregations for adults and children. Electronic transfer directly from your checking account each month, or with credit and debit cards. 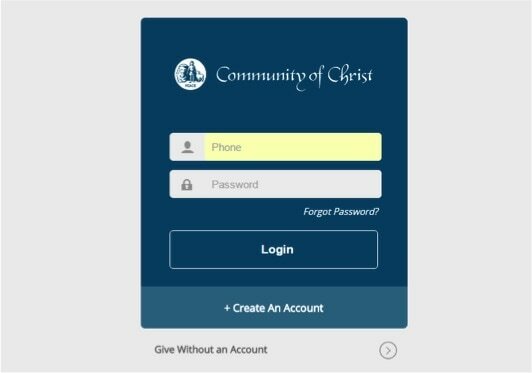 For a complete list of giving options, visit www.CofChrist.org/give.